This pillow is so cute and would look perfect as a decoration in your beach house or your room! 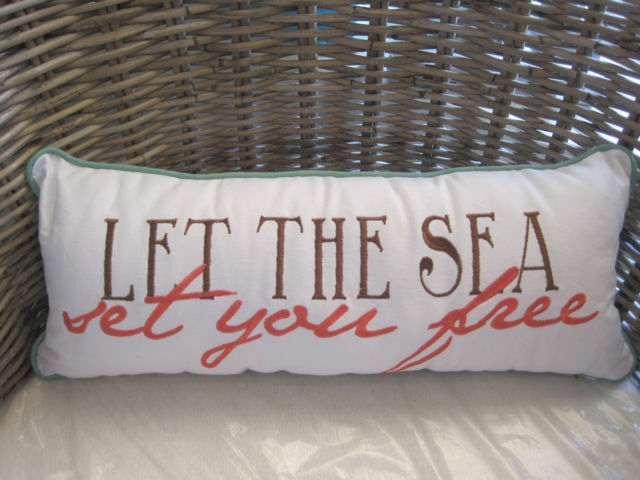 It is a white rectangular pillow that says, “Let The Sea Set You Free” in brown and orange cursive letters. It has a light green/blue piping along the edges. It measures 19″ x 7 1/2″. This pillow would be perfect as a gift for a a beach house, or a cute decoration in your home for the beach lover!